Migraine is characterised by recurrent moderate to severe headaches with a number of associated symptoms. The underlying pathophysiology is complex, involving the vasculature, central and peripheral pain signalling pathways, as well as inflammation. Both genetic and environmental factors are known to play a part in the disorder. The prodrome phase can include vague vegetative or affective symptoms as much as 24 hours before the onset of a migraine attack. These symptoms can include excessive yawning, hyperactivity, mood changes and sleepiness. The aura phase consists of focal neurological symptoms that last for up to one hour. Symptoms may include visual, sensory, or language disturbance as well as symptoms localising to the brainstem. The headache phase usually starts within an hour of resolution of the aura symptoms. The typical migraine headache usually appears with unilateral throbbing pain and associated nausea, vomiting, sensitivity to light and sound. Without treatment, the headache can last for up to 72 hours. The postdrome phase can last for up to 24 hours after the throbbing headache pain has resolved. Many patients experience malaise, fatigue, and transient return of the head pain in a similar location following coughing or sudden head movement. This phase is sometimes called the migraine hangover. 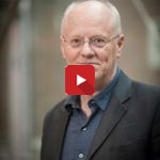 What is the burden of migraine to the individual and society? What are the unmet needs in migraine prevention? Both acute and preventive therapies can be ineffective or poorly tolerated and some have significant contraindications. For example, triptans, despite having only weak vasoconstrictor properties in humans, are contraindicated in patients with severe vascular conditions such as angina or ischaemic stroke, and in people with several untreated vascular risk factors. This significantly restricts treatment choice for these patients. Therefore, new drugs are needed to treat migraine attacks in patients in whom triptans are not effective, are initially effective but symptoms recur, are poorly tolerated, or are contraindicated. Despite many management guidelines being published by expert groups and policy makers (e.g. American Headache Society, NICE, SIGN, Canadian Headache Society, British Association for the Study of Headache, etc; refer to http://www.cgrpforum.org/resources/links/) there is discordance between them in some areas including classification and risk-benefit profile for treatment options. There is a clear need for consistent guidelines endorsed by all interested parties. Headache Classification Committee of the International Headache Society. The International Classification of Headache Disorders, 3rd edition (beta version). Cephalalgia 2013;33:629-808. Steiner TJ, Stovner LJ, Birbeck GL. Migraine: the seventh disabler. The Journal of Headache and Pain 2013;14(1):1. Dodick DW, Loder EW, Manack Adams A, et al. 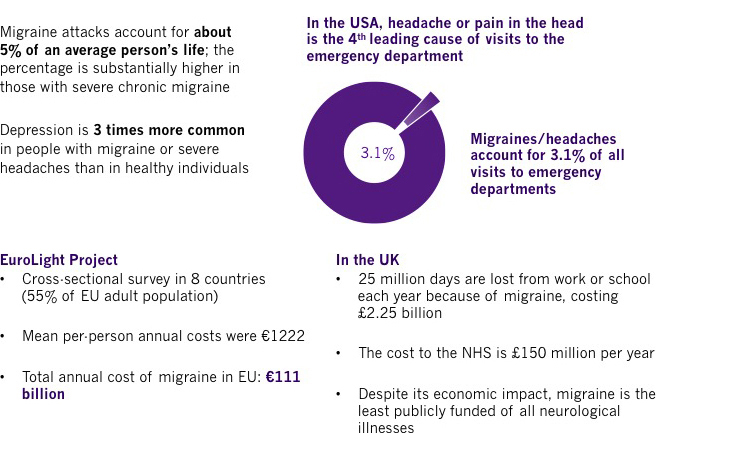 Assessing barriers to chronic migraine consultation, diagnosis and treatment: results from the chronic migraine epidemiology and outcomes (CaMEO) study. Headache 2016;56:821-834. Shapiro RE and Goadsby PJ. The long drought: the dearth of public funding for headache research. Cephalalgia 2007;27:991-994. Linde M, Gustavsson A, Stovner LJ et al. The cost of headache disorders in Europe: the Eurolight Project. Eur J Neurol 2012;19:703-711. Giamberardino MA, Martelletti P. Emerging drugs for migraine treatment. Expert Opin Emerg Drugs 2015;20:137-147. Diamond S, Bigal ME, Silberstein S, et al. Patterns of diagnosis and acute and preventive treatment for migraine in the United States: results from the American Migraine Prevalence and Prevention study. Headache 2007;47:355-363. Diener H-C, Charles A, Goadsby PJ, Holle D. New therapeutic approaches for the prevention and treatment of migraine. Lancet Neurology 2015;14:1010-1022. Blumenfeld AM, Bloudek LM, Becker WJ, et al. Patterns of use and reasons for discontinuation of prophylactic medications for episodic migraine and chronic migraine: results from the second international burden of migraine study (IBMS-II). Headache 2013;53:644-655. Hepp Z, Dodick DW, Varon S et al. Adherence to oral migraine-preventive medications among patients with chronic migraine. Cephalalgia 2015;35:478-488.